Students for Liberty says Democratic Rep. Alexandria Ocasio-Cortez launched a “smear campaign” against them. Students for Liberty (SFL) CEO Dr. Wolf von Laer said in an emailed statement that Ocasio-Cortez and Democratic Maine Rep. Chellie Pingree were “using their positions of power to execute a smear campaign” based on a misleading report. Ocasio-Cortez and Pingree sent letters to the CEOs of Google, Facebook, and Microsoft on Monday over their sponsorship of LibertyCon, SFL’s annual conference that was held in Washington, D.C., in January. Lawmakers sent their letters after Mother Jones, a progressive news group, reported that LibertyCon “promoted climate change denial to young libertarians,” largely because it had a session on the potential benefits of increased atmospheric carbon dioxide levels. The session, titled “Let’s Talk About Not Talking: Should There Be ‘No Debate’ that Industrial Carbon Dioxide is Causing Climate Catastrophe?,” was led by retired statistics professor Caleb Rossiter. Mother Jones reported Rossiter’s CO2 fertilization claims put him on the “far fringes of the climate denial world” even though NASA, hardly a bastion of “denial,” released a study in 2016 that attributed much of the “global greening” observed in recent decades to human CO2 emissions. Ocasio-Cortez and Pingree, however, told tech companies that “the spreading of misinformation can be dangerous to our society” and condemned the companies’ “implicit” support of Rossiter’s LibertyCon talk. 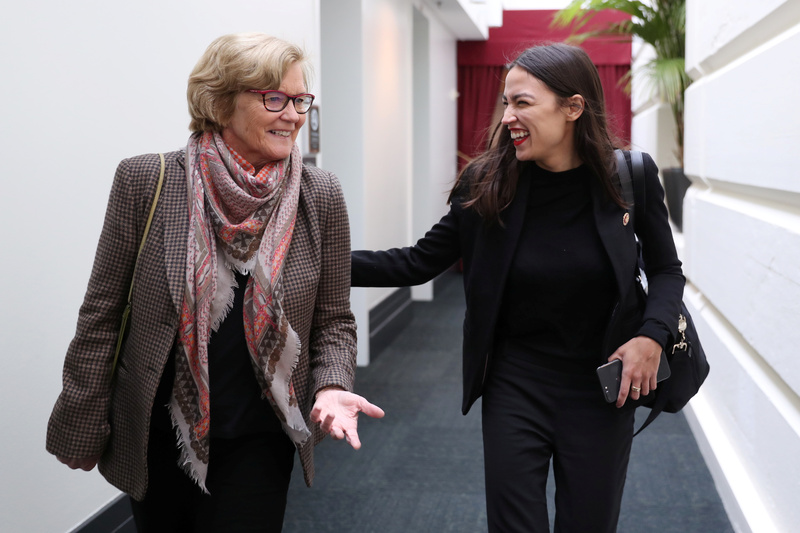 U.S. Representative Chellie Pingree (D-ME) and Representative Alexandria Ocasio-Cortez (D-NY) arrive for a House Democratic party caucus meeting at the U.S. Capitol in Washington, U.S. January 9, 2019. REUTERS/Jonathan Ernst. Ocasio-Cortez has made global warming her central issue. 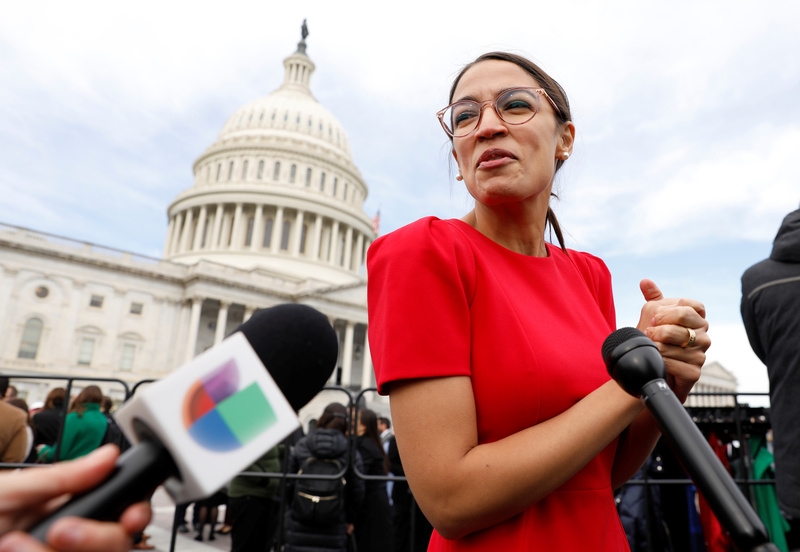 The freshman Democrat champions a “Green New Deal” that aims to eliminate fossil fuels and, as she’s said, ameliorate social and racial injustices. Pingree accused Facebook, Google and Microsoft of “secretly working against” fighting global warming, despite their public pledges to stick to the Paris climate accord. All three companies signed the “We Are Still In” pledge to support the global warming agreement. However, Clement said the tech companies did not fund Rossiter’s session. Clement also said Rossiter did not make the argument that global warming wasn’t happening, but that there could be upsides. “All the session in question did was make the argument that there may be positive externalities from climate change,” Clement said. LibertyCon also featured a panel debate on a carbon tax that featured both sides of the argument. A few groups on the right argue in favor of a carbon tax, though most conservative and libertarian groups oppose the idea. Ocasio-Cortez’s office did not respond to TheDCNF’s request for comment.